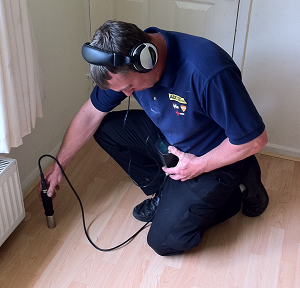 Where Can Leaks Appear On Your Property? The really short answer to that question is that a leak can potentially appear anywhere on your property. It won’t matter if it’s a business unit or your family home there’s no real logic to how leaks work. There are any number of factors that can cause a leak to start such as soil erosion beneath pipes, building subsidence, repeated heating and freezing of pipes during cold weather, the material the piping is made from or just simply old age. It doesn’t matter how modern your property appears to be the piping inside it could be decades old. You’ll find that when a property is gutted and totally renovated it’s rare that all the pipes are replaced simply because of the expense involved and the attitude of “if it’s not broken then don’t fix it”. This is all well and good initially but problems can and will appear down the road. Most leaks tend to appear in ceilings and around walls after the cold winter months. Your property might have been experiencing a leak for several weeks before you notice even the first signs of it – more often than not the leak damage is actually far more extensive than you might have imagined and even finding the first sign of the leak usually requires specialized equipment such as the thermal imaging cameras and moisture detectors that our engineers routinely deploy during the leak detection surveys. The real problem is that unless you’ve been trained in leak detection and you’re using very modern leak detection equipment the chances of your finding the source of your water leak is almost zero. And that difficulty simply increases when you have to start working with underground water or gas leaks and especially with mains water leaks. 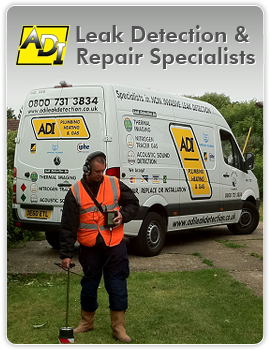 A leak can appear anywhere but only ADI London are going to be able to find it for you.